People will forever debate over who is the best Batman. Even though I already settled that argument with THIS LIST. 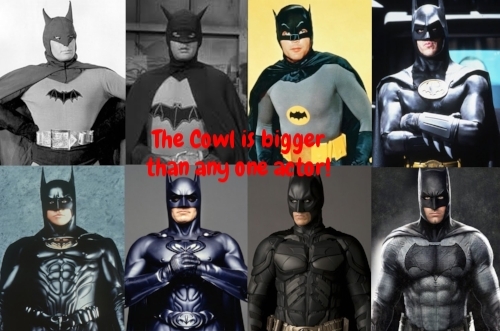 I guess the point is, Batman isn't connected to just one actor. Like Spider-Man, everyone can have their favourite and no one is ever truly wrong. This list, however, is here to celebrate the actors who made a role their own. Actors that did such a great job that no one could replace them in the same continuity. Actors that did such a great job that even if someone stepped into that role in a reboot we'd still think this actor was better than the new actor. As big a fan of Henry Cavill, in whatever version of Superman DC is trying to pull off right now, as I am, it is clear to me that everyone is trying to chase the vibe created by Christopher Reeve. That's the look and tone I certainly look to when I think of what makes Superman work. You can do whatever you want with the suit, but Chris is the gold standard for how to portray Clark and Supes. Of course, I'm not the biggest Superman fan overall, so maybe people will disagree with this. Outside of how Patrick looks, which is to say, perfect for the role, it's Patrick's whole demeanour. He'll give you hints of the not so nice, secretive, Charles, but always feels like the father figure he needs to be. It's not even like Patrick had to grow into the role during his 17 year tenure. He owned the role from the first bit of narration he did in the opening credits of the first movie. Wolverine is one of my favourite comic book characters. Hugh Jackman is a big part of keeping him relevant. Hugh did such a great job that everyone just let it go that he wasn't a barely five foot wrecking ball. Hugh Jackman commit to this role so hard that we all just changed our definition of what Wolverine should look like, just as long as Hugh was playing him. That means that for 17 years we never got a blue and yellow or blue and brown suit and no real harm was done. There is no doubt one of the consistently good things about the Sam Raimi Spider-Man movies is J. Jonah Jameson. J.K. Simmons' casting in this role is the reason lists like this are made. J.K. is over at DC playing James Gordon and people still think J.K. should come back as JJJ. What a perfect look and characterization this was. J.K. even provided the voice in an animated iteration of Spider-Man. In only three films he has made his indelale mark on the character. I saw Justice League, and trust me, Gary Oldman has nothing to worry about. I didn't really care about Gordon until Gary showed up in the role during the Nolan films. There is a warmth to his performance that draws you in. I should also point out that in a movie filled with amazing Joker moments, I still think fondly of the moment that James Gordon gets to tell his son that, for once, he got to save Batman. I guess what I'm getting at is that, Gary Oldman's performance made Gordon a character that I felt was worth checking in with when he wasn't just on top of a roof wondering how Batman silently slipped away one more time. RDJ's performance as Iron Man is an instance of me not thinking about him for the role and then realizing he's perfect for it. It's easy to simply say that RDJ is just playing himself. But there's more to the performance than that. I believe Robert when he's spouting off a bunch of scientific jargon just as much as I believe him when he's playing the rich jerk. His work in Civil War was also great. He's not just some smart mouth, he's someone who has father issues and a big soft spot for his mom and I can't see anyone but RDJ pulling that combination off. Ryan Reynolds was born to play Deadpool. And thank goodness he knew it too and forced the issue so that we could forget about Green Lantern and enjoy a fairly faithful representation of all that makes Deadpool interesting. It should also be mentioned that I thought Ryan was the best part of X-Men Origins. He has the perfect amount of snark in his voice and comedic timing to pull off a proper Deadpool portrayal. Go ahead, try to think of someone else as Deadpool... you can't! This may speak to the relatively short life of this character in comics compared to the rest of these characters, but, Chloe Grace Moretz made Hit-Girl a hit! I don't think this is a role anyone could do. It required a very specific type of child actor. Not one that was just acting like an adult, but one who could actually come off as a child in adult situations. That child actor is Chloe. I've always maintained that I haven't liked a Thor movie, up until Ragnarok, but, always thought Thor was played really well by Chris Hemsworth. There is a charm to Chris that elevates all the characters I've seen him play no matter how much screen time they get. Chris has made sure that his version of Thor never feels one note. In someone else's hands I feel like he could just be played as dumb muscle. This is why I think Chris was the right and only choice for this role. I went back and forth on Chris Evan's inclusion. I couldn't tell if I just liked Chris' interpretation of Captain America, or if he legitimately is doing something no one else will be able to match or surpass. I ultimately feel that Chris has given us the best version of Captain America possible. I like the Captain America trilogy the best. And I think Captain America, in the comics, has similar barriers to my enjoyment as Superman. However, Chris has made him a guy who just hates bullies, and he can leave the boy scout/American flag waving to the side. I really do feel like They won't replace Chris Evans in this continuity like they've done to the Hulk and Rhodes. They will just go the comic route and make Bucky and Sam Wilson Cap when Chris is gone. Like Thor, Drax, could come off as one note and bland in the wrong hands. Dave Bautista infuses Drax with a real personality. Yes, you know that he's going to take things literally, however, he's more than just the guy who doesn't get metaphors. He's a well rounded character and I think that's Dave Bautista's doing. His delivery of lines always has a certain thoughtfulness that feels entirely unique to Dave. I'm a big Chris Pratt fan. Mostly because of Parks and Recreation, but, he did his thing in the Guardians movies. He did veer away from the way Peter Quill has been portrayed in the past, but, he made the character instantly likeable and, like Robert and Hugh before him, made audiences accept him as the new Star-Lord. So much so that I feel like if they ever reboot the Guardians franchise, they may avoid Star-Lord or try to recreate the Chris Pratt magic instead of going back to the comic accurate Star-Lord. I was sort of underwhelmed by the news that Gal Gadot was cast as Wonder Woman. I saw her as the woman from Fast and Furious 5 & 6. Two movies I genuinely like, but, didn't see the vision for her as Wonder Woman. To be fair, I don't know who else I would have cast. After BvS, I thought she was definitely the most interesting character, and after Wonder Woman it was clear Gal was definitely the right choice. Gal comes off as irreplaceable because of the perfect mix of strength and warmth she brings to the role. I didn't see that interpretation coming and I instantly liked it. Chadwick is perfect for Black Panther because he doesn't really come with baggage. He is a talented black actor so he's not a blank slate either. The fear with these types of roles is that the it actor of the time gets cast or a no name actor is cast and the character doesn't really succeed. Luckily, Chadwick Boseman made Black Panther a memorable part of Civil War and looks to be ready to take on his own movie all while not having an embarrassingly off the mark accent. I know that Wakanda isn't a real country, but you get what I mean. There have been a couple of interpretations of Amanda Waller on TV and even one in film. That's right, Angela Bassett, of all people, has already played Amanda Waller and I'm sure no one was mad when she wasn't brought up to play the role again in Suicide Squad. People will definitely look for Viola Davis to continue playing Amanda Waller. Regardless of what you feel about Suicide Squad, there is no denying Viola brought the pain as Amanda Waller. Even the villains are a bit afraid of her.